Inspired in part by Jorge Luis Borge’s contention that a book is “an axis of innumerable relationships”, Jenn Law examines print culture, bibliophilia, and textuality through the close material readings of several key texts. Law’s practice centers on the artifacts of reading and writing, making hand-cut prints and sculptural paper works from found books, as well as using digital technologies to fabricate 3D printed ink bottles, fountain pens, books and printing presses. In the face of contemporary debates surrounding the purported crisis in print culture, Law contemplates the future of the book, our fetishization and attachment to its physical object-form, and our desire to collect and possess the knowledge contained therein. In Artifact, Law has created a book using the newest printing technology, 3D printing. The object is a ‘replica’ of a book by Edmund C. Berkeley, an American computer scientist who wrote one of the earliest popular publications on computers in 1949, called “Giant Brains or Machines That Think”. The volume is open to Chapter 11, in which Berkeley imagines what the social impact of computers will be for mankind. 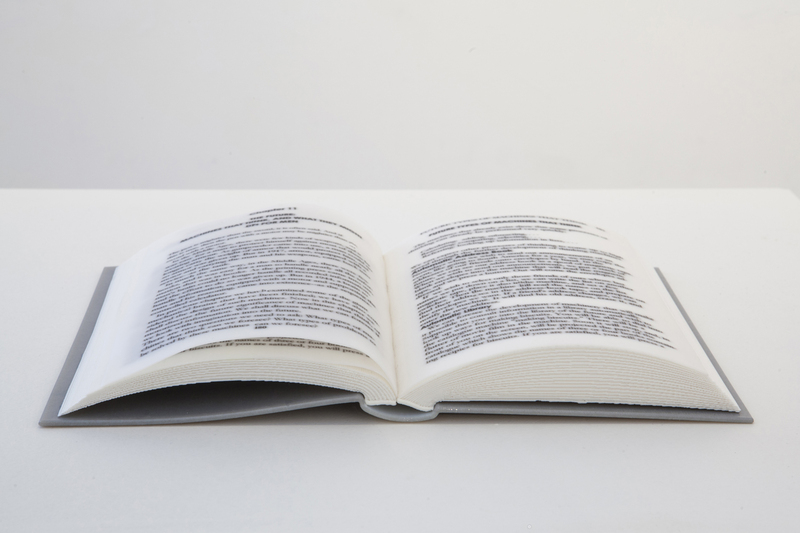 This 3D printed work is a carefully constructed illusion of a book. The pages are printed on the surface, but do not turn; the book is open, but cannot close. Although fabricated using the most advanced printing technology, it is in fact unreadable – it exists solely as an art object, an artifact of sorts. As a book, it is redundant.